The 2011-2012 basketball season was an up and down season for the guys. Expectations were high entering the season because of the best finish in school history the year before. The senior class of Jon Bai, Raymond Lee, Brian Chang, and Anthony Kim looked to capitalize on their experience and talent. The guys started the season out with disappointing losses against TCIS and Daegu the first weekend. These losses became motivation to continue to improve and not take anything for granted. 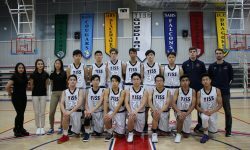 Although the guys ended up in a tie for 3rd with TCIS, they finished out the season strong, with a road win against 2nd place Daegu and a historic home win against the undefeated SAHS Falcons. This would be the only SAHS regular season loss in 3 seasons and the first win by the Guardians against SAHS in our history. With a #4 seed in the tournament, the guys had to play SAHS again in the semi-final game. It was a very close, hard-fought match-up, but the guys lost because of a 6 point run in the 4th quarter. They ended up winning 3rd by beating Osan in the 3rd-place game. Far East also held great expectations for the guys. While they again had a rough start in pool play, they came back to fight hard in tournament play. Losing to repeat champion Morrison in the 2nd round, the boys fought from the loser bracket to earn one of only four spots on the final day. To get there they had to go through D0DDs Japan champion Edgren on Thursday night. Down by 10 at half time and the Eagles stalling, it didn’t look good for the guys. But the seniors stepped up their game and pulled together to beat the 18-2 Eagles in the end. The loss Friday morning against Daegu gave the Guardians 4th place for two consecutive years. The basketball program will truly miss this senior class. Congrats on great careers in the YISS program.